With a sufficiently long burn at LOI, the altitude of the apolune would match that of perilune, 110 kilometres, and the orbit would therefore be circular. For Apollo, the burn to achieve circular lunar orbit was between 5 and 6% minutes long, depending on the mass of the spacecraft and the precise thrust of the SPS engine. 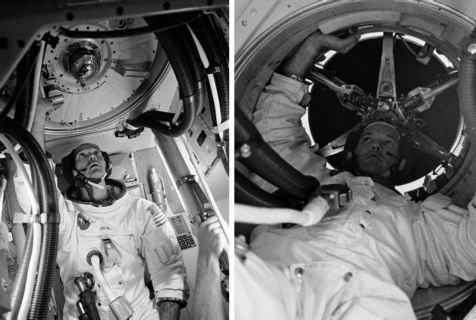 However, to make an LOI manoeuvre for a circular orbit at the first attempt raised great dangers for an Apollo crew. If the engine were to slow them down too much, either by overperformance or perhaps through failure of the control equipment, the altitude of their orbit over the near side could drop so low as to become a negative value. Put less euphemistically, the spacecraft would descend until it augured into the lunar surface at great speed. Given the imprecise knowledge of the Moon's shape at the time of the early missions, this was considered to be a very real danger. To avoid the possibility of impact, the Apollo SPS made an initial large burn that was slightly shorter in duration than the burn that would be expected to produce a circular orbit. This was the first lunar orbit insertion burn, or LOI-1, and it placed the spacecraft in an elliptical orbit with a perilune of 110 km around the far side, and an apolune over the near side that was typically around 300 km altitude. After two orbits, which was more than adequate time for the shape of the orbit to be precisely measured by radio tracking from Earth, an additional short burn, LOI-2, was made at perilune in order to lower the apolune enough to make the orbit circular. When the crew monitored these long burns, duration was not the only value that interested them. Although the thrust from the SPS was accurately calibrated, there were always small variations in its power that made the length of the burn less reliable as an indicator. What was more important was delta-v, the change in velocity brought about by the engine. Throughout a burn, this value was measured by the guidance system and displayed in front of the crew. If all was proceeding normally, the burn would be stopped automatically by the computer once it had achieved the required delta-v. If that failed, there was a backup system that independently measured and displayed delta-v and could also shut the engine down at the right time. Finally, there were three pairs of eyes eagerly looking at both delta-v displays, ready to reach out and manually cut the SPS engine if it seemed to be burning for too long.